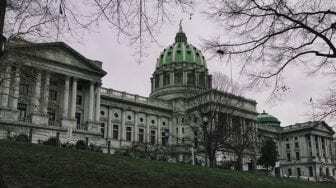 HARRISBURG, PA (WSKG) — In the waning days of the legislative session, House lawmakers are hurrying to push priority bills out of their chamber and on to the governor. The latest bills queued up to likely become law include revamped graduation readiness standards and an anti-hazing measure. The hazing bill has been in the works since March–about a year after Penn State Student Tim Piazza died following a hazing ritual at a campus fraternity. The measure would let prosecutors seek more severe penalties in hazing-related cases. Its sponsor is Penn State grad and Senate GOP leader Jake Corman. When his chamber passed the proposal in April, Corman noted on the floor that it’s also designed to make fraternities take responsibility for their pledges. “National organizations that are not putting out the proper discouragement for this type of behavior could be held liable through organizational hazing, and it could lead to forfeiture of property if necessary,” he said. The House made some minor changes to the bill, and Senate leaders have said they aim to concur on the language quickly and send it to Governor Tom Wolf, who supports it. The same is true for another measure newly passed by the House. It would give students more ways to prove they’re ready to graduate high school–beyond the customary Keystone exams. Still on the House docket this week is a bill that would establish a statewide system to help protect child victims of human trafficking. It has been in the works since March 2017 and has virtually no opposition, but has yet to be called for a final vote.